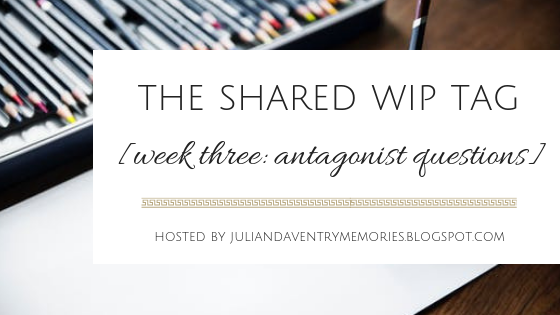 Aaaand, we're back in week 3 of the Shared WIP Tag!! Introduce the main antagonist of your book! Anyways, Zephr is the 9th king of Ilia Couragis. He is married to Queen Yalia who was a noble lady in Ilia Couragis. They have three children: Yohn, and twins Zoe and Zelia. What do you (the writer) have in common with the antagonist? What do you not have in common? Hm....what do I have in common......I guess what we have in common is the fact that we both have a need to control things (ask my family :P). What we don't have in common is that I'm not trying to hold my kingdom together and avoid civil war. What does your antagonist do when he/she is mad? Do they have a soft spot? And his soft spot is his family. Who is your antagonist’s worst enemy? What is their greatest fear? I would say that Zephr's greatest enemy is the unknown. He hates change, because it means he has to be a little less controlling, and with the unknown people could get hurt. His greatest fear is that his family will get hurt. That if the people rise, they'll hurt his family. What is your antagonist’s weapon of choice? I think that his weapon of choice is the fact that he is king. Since he holds a lot of weight as king, he likes to use that before resorting to physical violence. How would your antagonist surprise your reader? Anyways, I think he would surprise them in the way that he is actually quite playful and funny with his family and very VERY close friends. What is one thing your antagonist would never do? What lie does your antagonist believe about the MC? Zephr believes that Kile is just an inexperienced boy. That he should listen to his elders instead of offering them advice. What is your favorite thing about your antagonist? My favorite thing about Zephr (besides the fact that he looks like Hugh Jackman :PPP) is the way he is around his family. He loves them so much that he doesn't know what to do with himself. If your antagonist was your MC, what would your book look like? Gosh, I have no idea. What I think the book would look like, if Zephr were my main character, is everything that Kile sees Zephr do that is "wrong" would look extremely different in Zephr's eyes. What Zephr would see his actions as is the last resort. This ends week 3 of the Shared WIP Tag! Join me next week for questions on side characters and world building! How's your Nano going? Are you still on top of your daily word count? What is your favorite thing about your antagonist? Honestly, a antagonist that looks like Hugh Jackman... SOLD. I'm a control freak too! 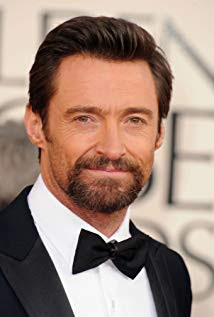 Love that Hugh Jackman is his inspiration! That last question, whew! that's a hard one to answer. But it's kinda neat, too. That was a really hard question to answer, but you're right, it is really neat. Everyone, to some extent, hate's change. Lolol, I pictured him as Hugh Jackman and was like, "AW MAN CAN'T MAKE HIM TOO UNLIKEABLE NOWWW"